At home in the trees of the Southeast region of the United States, the green tree frog also makes a colorful indoor pet. These amphibians are nicknamed rain frogs because they sometimes call more loudly during rainy or humid weather. Frogs have special requirements, so spend time becoming educated on their characteristics and care needs before adopting one. Green tree frogs grow to a length of about 1.5 to 2 inches when they are adults and can live up to 6 years as pets when they receive proper care. They have sticky pads at the ends of their toes and fingers that help them grip and climb. A green tree frog is, of course, green. He sports a light- to medium-yellow stripe from his back legs to his head. He may also have yellow spots on his back. 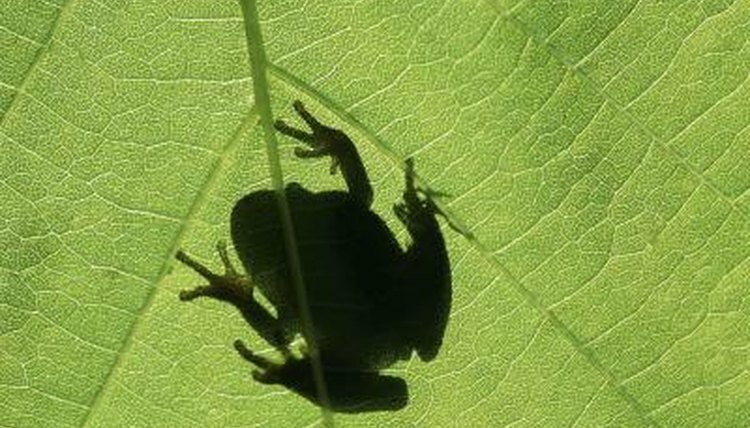 One unique feature is this frog’s ability to change his color from green to brown and back to green, based on the humidity level, light and temperature in his environment. Breeders and pet stores sell pet green tree frogs, which are more readily available in the spring and difficult to find for sale during autumn and winter. Many of these frogs that breeders and pet stores sell show signs of illness, such as sores on the skin, swelling or unhealthy-looking coloring. Monitor these pets closely for at least a few weeks after bringing them home, staying on the lookout for any health problems. Because tree frogs like to climb, a vertical rather than horizontal tank or terrarium provides a good habitat. The more space, the better, but a 10-gallon tank suffices. The tank needs a secure screen on the top to prevent the frog from getting out. Bark, sand or small stones are not good substrates for the bottom of the habitat, because they could harm the frog if he swallows them. Smooth large rocks or coconut husk material make better substrates. The green tree frog enjoys perching in the terrarium on bamboo poles or driftwood. Living or artificial plants further enhance the tank. To be comfortable and healthy, the green tree frog needs a daytime room temperature between 72 and 80 degrees Fahrenheit, and at night the temperature can be as low as 65. A pet frog needs plenty of humidity, so spray him and his tank with filtered or spring water from a spray bottle about once a day. The tank needs to be cleaned with warm water about once per week. Inside the tank, the tree frog needs a shallow dish filled with clean spring water or filtered tap water that contains no chlorine or other contaminants. The frog uses this water for cooling off his body and for defecation, so you must change the water frequently. Green tree frogs eat mostly crickets, plus some flies, moths and worms. Green tree frogs are nocturnal, meaning they’re more active and alert at night. They get along well with humans. Because these sociable little amphibians enjoy being with each other, consider having more than one of them.